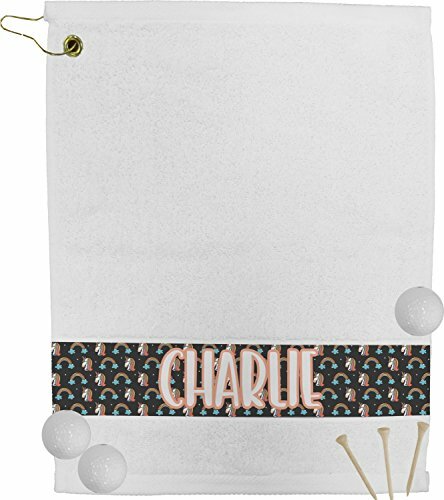 No need to make a stop at the golf ball washing station when you have our personalized golf towels clipped to your golf bag; the towels are practical and stylish. They are great for personal use or you can give them as gift with golfing style. You can personalize the strip on the bottom of the towels with a name, monogram, or initial. The grommet and clip make them easy to hang on your golf bag while cleaning and drying your golf balls and clubs will be a cinch when you use these absorbent towels. What is more magical than a majestic unicorn? Nothing. Absolutely nothing. Get yourself feeling as happy as the sun with this charming unicorns design. You will be filled with rainbows and butterflies every time you look at this design. This fun unicorn design has a dark grey background with brightly colored unicorns and rainbows all across it.This pattern is on either side of a peach background with subtle crowns on it. Front and center is a fun saying that says "Charlie Believes In Unicorns" where "Charlie" can be replaced with your name. On the top of this text is a majestic leaping unicorn. In our design center you can change anything you want! Change the text, add a large graphic, change the colors, and more. Create the perfect design to transport you to your happy place. If you need any help creating the magic, just let us know. We are always happy to help!